On Monday, Florida Congresswoman Lois Frankel, the chair of the House Democratic women's working group, tweeted the style code, saying the color denotes "the economic security of women and their families" and the blue majority of House Democrats. Frankel also tweeted Tuesday, "At State of the Union tonight, Donald Trump will look out at the House Chamber and see a sea of Suffragette white sending the message loud and clear." According to the Washington Post, in the 1990s, female protesters wore white dresses to pop in newspaper photos, borrowing from the British suffrage movement's official hues. In 2016, Hillary Clinton wore a white pantsuit to accept the Democratic presidential nomination, designed by Ralph Lauren. In November that year, the hashtag #WearWhitetoVote was used in support of electing a female president. 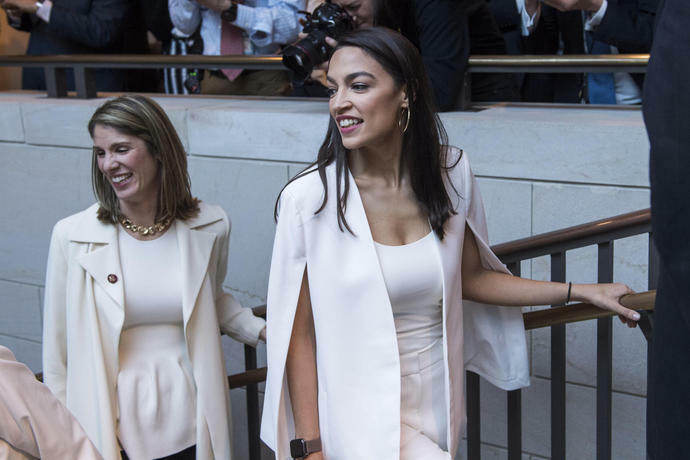 In January, Alexandria Ocasio-Cortez wore white for her swearing-in ceremony as the youngest female congresswoman in history, and at the 2018 SOTU - while female attendees sported black to support the Time's Up and Me Too movements - Melania Trump's Christian Dior white pantsuit drew parallels to Clinton. In February 2017, Trump's joint session of Congress also had a white theme. As then-Congresswoman Karen Bass told the Los Angeles Times, the color represented unity among anti-Trump women "and just women in solidarity with each other against a president who ran a campaign that was rooted in misogyny." According to Mashable, women in white booed and gave the thumb's down during the president's speech. Both Democrats and Republicans traditionally invite special guests to the State of the Union. This year, the first couple welcomed family members of a Reno, Nev., couple who were killed, allegedly by an undocumented immigrant, in January; a Delaware elementary school student, Joshua Trump, who was bullied by his peers for his famous name; and former inmate Alice Johnson, who was granted clemency with the help of Kim Kardashian and criminal justice reform advocates. The Democratic list includes, according to Vanity Fair, Ana Maria Archila, who publicly asked Sen. Jeff Flake to vote against Supreme Court nominee Brett Kavanaugh during last fall. Former Trump employees who are undocumented immigrants and parents of the Parkland, Fla., shooting victims are also expected.